Want to buy the Carex Day Light Sky? Note: All images used in this review have been kindly provided with the permission of Carex Health Brands. 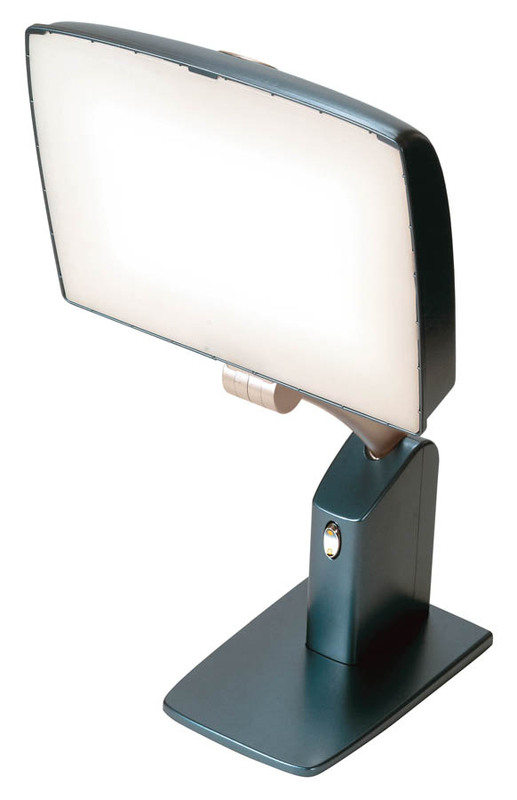 Very high quality, top of the range SAD light, the Carex Day Light Sky provides light from above, is ultra-adjustable and has a beautiful light quality. If you decide you want to get the Carex Health Brands Day-Light Sky, see where you can get the best price. To get the best out of the Day-Light Sky your eyes need to be 11 inches from the centre of the light lens and looking down. This will give you the full 10,000 lux and you are advised to spend 20 to 30 minutes per session of light therapy. The light has two settings: therapy which provides the full 10,000 lux or ambient which provides 6,500 lux. It also has an angle and adjustment button that allows you to tilt lamp backwards and forwards and the light head can be rotated 45 degrees. Unlike the Day-Light Classic it does not have adjustable legs that can be raised or lowered, but you can move the lamp head up and down which effectively does the same job. There are large chrome push buttons on the side of the device’s arm and also the light head which you push to adjust the height and angle. When you push the button in it is locked into place and won’t move. There is a toggle switch at the front of the base of the Day-Light Sky that lets you switch between the therapeutic light level, ambient light level or turn the device off completely. The device uses two 55-watt compact fluorescent bulbs. They are rated for 8,000 hours and cost around $20 to replace. The color temperature of the light is about 4000k. In much the same vein as the other excellent Carex product – the Day-Light Classic – the Day-Light Sky really excels as, unlike many SAD lights, its design means that during light therapy the light enters your eyes from above – the optimum positioning for it to be most effective. Think about when the sun hits your eyes in real life, it obviously comes from above you. Many SAD lights rest on your desktop, but this one doesn’t which gives it a big head start over its competitors. Check studies on light therapy and they all say for it to be most effective the light needs to shine from above so this ticks that box. Talking of the light – the light quality is fantastic. There is zero flicker, the diffuser cover helps to soften the light so it isn’t so bright it might cause headaches, there is no glare and the lights come on and turn off instantly. The field of light is also huge. This means when you are using the light you can have a normal range of motion and your eyes will still be in the field of light. It is great to have a light with such a generous zone of effective therapy as there are lots of small SAD lights with tiny fields of light. Finally on the subject of light it is a great task light when used on the lower light level. The white light, with no glare or flicker, means it is amazing for craft or detailed orientated work. The construction is a step up on the Day-Light Classic. It looks and feels very sturdy and well made. The weighted base is solid and there has been no skimping on lightweight parts – everything seems to be first rate in terms of the build quality. Finally the adjustability is another great feature of this light. 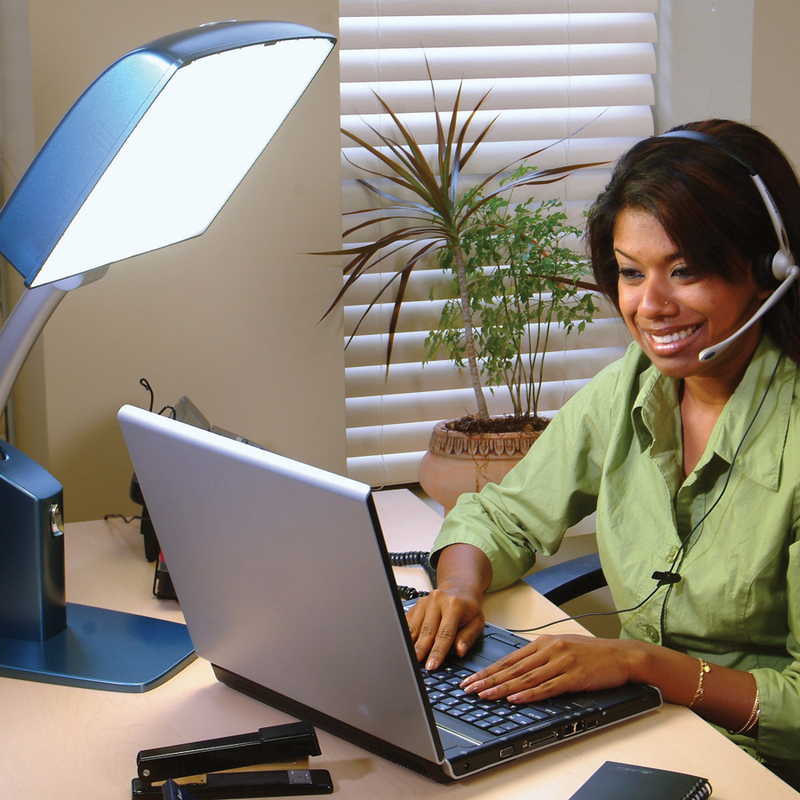 The articulated arm can lock into many different angles and the neck of the lamp has several pivots meaning you have a huge number of choices when positioning the lamp for therapy or work at your desk. In all honesty it is hard to find too many faults with the Day-Light Sky although some maybe put off by the large footprint of the unit. For instance if you wanted to use it whilst you work on your computer it might be a little too large to put on your desktop or to place behind the monitor and still be within the therapeutic range. With the Day-Light Classic you could place it over your laptop due to the way it is designed – however that is more difficult with the Day-Light Sky. Think about where you plan to use it before buying it. You will probably at some point need to replace the bulbs as well. These are fluorescent bulbs and are rated for 8,000 hours, but the intensity does degrade over the bulb life. Unlike LED bulbs which last almost forever it is recommended you replace these bulbs every two years. And really aside from a couple of minor quibbles, like it is slightly top heavy and only operates on 110Vs that is it – there isn’t much else to complain about. The lamp has a fairly contemporary design and does not look like a medical instrument. It wouldn’t look out of place on your office table and in fact would probably fit discreetly into any setting. The Day-Light Sky is certainly a step up from the rather ugly Day-Light Classic – I like it! Yes, yes and a big resounding yes! The positive feedback on this is almost endless. 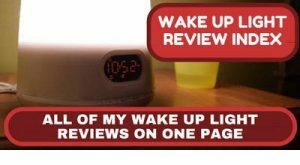 One user said it changed their life and another said using the lamp made them feel instantly more awake and alert. Others have said it far exceeds their expectations with many saying they are completely transformed and left with a more positive, upbeat outlook. This lamp works and is very highly thought of by those who buy it. The Day-Light Classic was top notch, but there is no doubt that the Day-Light Sky is a step up even on that excellent SAD light. It builds on all the good points of the Classic – the light still enters the eyes from above, the field of light is still huge and the quality of the light if anything is even better making it an excellent light for detailed work. Gone are the spindly legs which were a failing of the Day-Light Classic and in their place is a much more sturdy feel and a huge amount of adjustability to position the light just as you want it. This is a top quality light – right up there amongst the best SAD lights you can buy. If you do buy it you won’t regret it. There really aren’t many better options than the Day-Light Sky – it is the best of the bunch, but the Day-Light Classic and the Verilux Happy Light Liberty 10k are also excellent SAD lights. The Carex Day-Light Classic is great as it provides light from above (the best way to receive light therapy) and has a huge field of light. The Verilux HappyLight Liberty 10k is reasonably priced and another top of the line SAD Light – with a lovely tone of light and a flexible design that can also be wall mounted. But for me, I’d go for the Day Light Sky. Thanks for this review Steve. My wife and I are planning to Canada, and one of the things her physician warned us about was SAD. Since then I’ve been scouring the net looking for solutions, and came across this. I like the look and feel of it, and the size of the surface area for the lamp is very impressive! I also saw a number of light boxes too while searching. Is there a big difference outside of just size? Thanks Joshua. The thing I like about the Day-Light Sky is that you can set it up so the light comes from above and shines down onto your eyes. This is the optimal way to receive light therapy as it replicates the sun shining on you from above. Also the large surface area means you can move around a bit and no worry about moving out of the field of light. Good luck and enjoy Canada! My doctor has recommended that I look into Light therapy lamps, which has brought me to your review here. I’m one of those lucky (maybe not so lucky 🙂 ) that is affected by the lack of sunlight during the long winter months. I actually like the looks of this Day-Light sky and the large base is just fine with me. All I can say is that I’m sure glad I came across your review here, though I was wondering is it safe to have this on all day while working at the computer? Thanks Kim, much appreciated! Effectively you can’t overdose on light therapy, however it is recommended you don’t use it 3 to 4 hours before you go to bed as it can affect your sleep pattern, the best time of day to get in light therapy is first thing in the morning – but yes you could have it on all day whilst at your computer as long as you turn it off about four hours before you go to bed. Best of luck with your quest to find a good SAD light – I love the Day-Light Sky! Thank you Steve, that is good to know about the time frame. The cost is pretty reasonable so I think I will be getting one. Great to hear Kim – good luck! 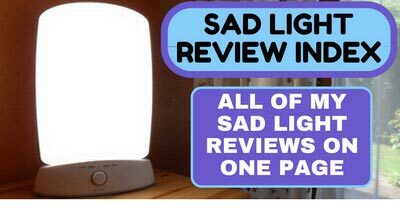 A very fortuitous article for me and my husband who are looking for a good quality light to dispel SAD symptoms which we both seem to be suffering. It has been a particularly grim winter here in Wales UK with much dismal weather, foggy and drizzly conditions which really get you down after a few months. We are hoping we can purchase this Carex lamp in the UK through Amazon. If we were in the US, we would be buying from your site but do not want to risk it being sent across the pond. I can empathise with your poor weather Ches – hope it picks up and we are almost into spring now! The bulbs are rated for 8,000 hours. It is recommended you replace the bulbs every two years and replacement bulbs cost around $16. Thanks for the good info Steve!! I never really took my SAD seriously. It’s one of those things you don’t realize is super hard and intense until it’s over. It’s been many years and I’ve gone through this mental cycle over and over again. I also suffer from Lyme and Celiac. They also seem to hit me hardest through the wintertime. I’ve tried a ton of different therapies for those illnesses but honestly didn’t see a difference until I start using light therapy to help simulate the warmth and light that my body needs in the winter. It was totally key in helping pivot me out of that vicious cycle. My favorite kind of light therapy is near-infrared. I pop that light on as often as I can letting the light fall mainly on my back. I’ve never tried a light like this one but maybe it would be more versatile than a clip-on heat lamp. ha! Thanks for all the good information on your site. Keep it coming. Thanks Helen – sounds like you have suffered in the winter and really glad you found this review useful. 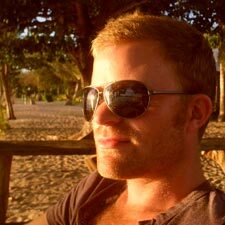 Light therapy can be totally life changing and I wish you all the best with your SAD and also Lyme and Celiac – must be tough. Take care and thank you for the kind comments. there is helpful information about the benefits and specs of the lamps. You covered almost everything in your replies to comments. There is only one question I would like to ask. You wrote a large footprint make it awkward to situate. Are there lamps with similar benefits, which you could place under the ceiling? Thank you Andrey. If you are looking for a smaller more portable light then I would recommend the Circadian Optics Lumos – which is portable and really good value for money.